The censure of minister of hydrocarbons, Andres Soliz Rada, yesterday by the Senate unleashed a political war. In a message to the country, president Evo Morales Ayma declared the senators of Social Democratic Power (PODEMOS) to be “traitors to the homeland, killers and mass murderers”. “The nationalisation will not be stopped. The traitors to the homeland, the killers and mass murders do not want the politics of this country to change” signalled the head of state, in tones which demonstrated his annoyance. “There are traitors to the homeland, and the people know that those who expelled me [from parliament] in 2002 now want to expel Andres Soliz Rada from the cabinet. They will not be able to expel nor paralyse the nationalisation and industrialisation of the natural resources” he sustained. After asserting that those who censured the minister of hydrocarbons are “the rubbish of the neoliberal model”, Morales rejected the resignation presented by Soliz and declared “shameful” the decision of the PODEMOS senators. The majority opposition in the senate (PODEMOS and National Unity, UN) censured Soliz Rada yesterday afternoon for supposed irregularities in the state petroleum company. The decision was passed by the 13 legislators of PODEMOS and 1 from UN. “The oligarchs want to disorganise our team, they want to declare politically dead one of the best ministers, but comrade Soliz is not alone, the people are with him” added Morales. In his resignation letter, Soliz said to the president that behind the censure against him “can be found the forces that want Bolivia to return to its condition of a semi-colony of the centres of global power, allied with the oligarchies that exploited our peoples for 500 years”. According to the chief of the parliamentary bench of PODEMOS, Oscar Ortiz, the decision to censure Soliz Rada was based on the inconsistencies and weaknesses of the report that the minister presented. “He declared that he did not know what is happening with the application of the nationalisation decree and what the president of Yacimientos Petroliferos Fiscales Bolivianos (YPFB) is doing”. An audit report from the Ministry of Hydrocarbons discovered signs of irresponsibility by the head of YPFB, Jorge Alvarado, who signed a contract with the firm Iberoamerica Trading SRL for the exportation of crude oil to Brazil. Nevertheless, for MAS this fact has no relevance. Senator and chief of MAS’ parliamentary bench, Gaston Cornejo said that the attitude of PODEMOS “needs to be understood as treason against the homeland, for being servants of the petroleum companies”. He warned that “there is no excuse” and that “now is the time of the trenches and of combat”. Jose Villavicencio, the only National Unity senator, justified his presence in the session that passed the censure motion, indicating that he acted according to his conscious. The minister of hydrocarbons, Andres Soliz, affirmed yesterday that he felt flattered to be questioned by the representatives of the oligarchy, referring to the decision adopted by PODEMOS and National Unity (UN), who emitted the censure vote in the Senate. 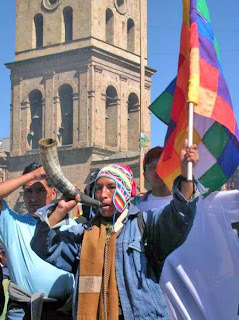 He emphasised that from now on when someone now asks him for his resume, he will put in a distinguished place the fact that he has been censured by the oligarchy and against the popular sentiment that accompanies president Evo Morales, which he called a “reopening of the national revolution with the participation of the social movements and the indigenous peoples”. He also denounced the fact that “the transnationals have the necessity to try and detain the revolutionary process of nationalisation, because it affects its interests that were protected under the neoliberal governments, who’s representatives censured it today in the senate”.